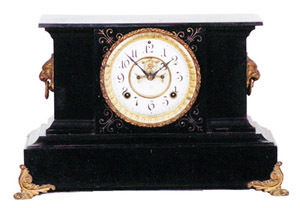 Ansonia Clock Co. enameled iron case black mantel clock, "Chester", ca 1904. The black iron case is 10 inches high and 16 inches wide, with gilt ornaments that are now dirty. Two piece porcelain dial with open escapement, beveled glass. Dial is good with no damage. The case has not been refinished, slight wearing of the enamel on some edges. Correct pendulum and back cover. Ly-Ansonia No.1010.